What could be more relaxing than spending time outdoors in a garden or an outdoor area at home? 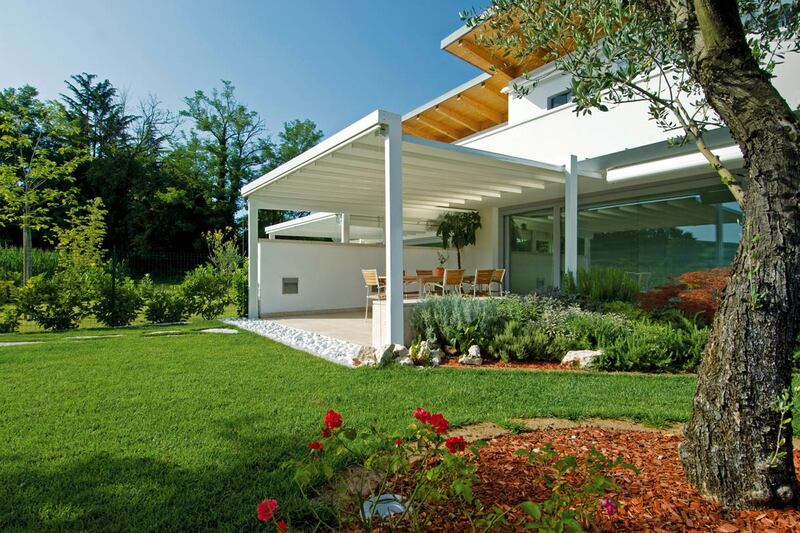 If you have the space, the ideal solutions are Pratic garden pergolas or covers. These products that are able to transform a simple outdoor area into a place of beauty and comfort. Inspired by the ancient shelters of Mediterranean culture, thanks to canvas covers, perimeter closures and the numerous available options, the pergolas and covers create areas enjoyable 365 days a year. The wooden garden pergolas are designed for those who love the essentiality and warmth of materials and are looking for a solution that fits harmoniously into the surrounding nature. The structure of Tecnic Wood and Tecnic Wood Plus is made of laminated Nordic pine, processed to keep its beauty unaltered over time. 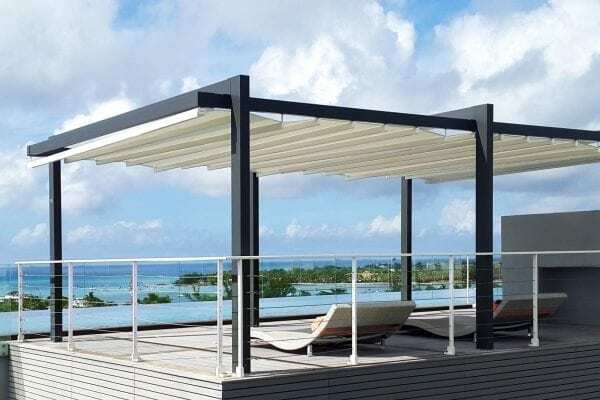 It has a Tecnic retractable cover system, made of PVC fabric or with shading fabrics, offering ideal protection at all times, even when it is rainy or windy. For the cooler hours and in the evening, perimeter closures and LED lighting are available. The iron garden pergolas are made of the lightest and most resistant aluminium. They can be customized by choosing among the numerous colours from the catalogue, colours designed to create contrasts or, on the contrary, to be as faithful as possible to natural nuances. They come complete with a PVC retractable cover that provides excellent shade while also protecting from the rain and wind. There are eleven self-supporting or wall-mounted models available. Opera and Vision are definitely the most advanced in the category of bioclimatic pergolas, which stand out for their total comfort. 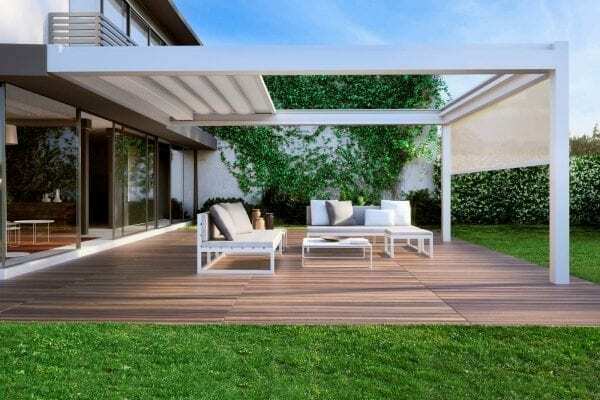 This is thanks to the adjustable sunscreen blades that create the ideal ventilation and lighting conditions underneath the pergola, by simply exploiting the sun and the wind. The design is enhanced by the following options: Slide Glass, a protective window panel that doesn’t block the view of the landscape. Spot lighting pods that can be placed directly inside the blades; Raso, the perimeter awnings that assure maximum privacy; and finally, the RGB LED lights, the colour of which can be changed to your liking. The Garden covers can be self-supporting, wall-mounted or suspended between two walls; One, Tecnic and Alutecnic are made with high-quality materials able to excellently withstand damage from wear and bad weather. All the models in the range are equipped with retractable awnings, customizable to your liking, allowing the light to filter in or, on the contrary, protecting the space underneath from sun and weather.